After election day, the last thing I want to see for a long time is a political comercial. Despite my wishes, the Annual Downtown Residents Association Meeting will be on Wednesday, and one of the attendees (or more, not mentioning any names) is just beginning his run for office in next years election. The topics of the evening appear to be updates on many of the exciting things going on Downtown, but nothing new. 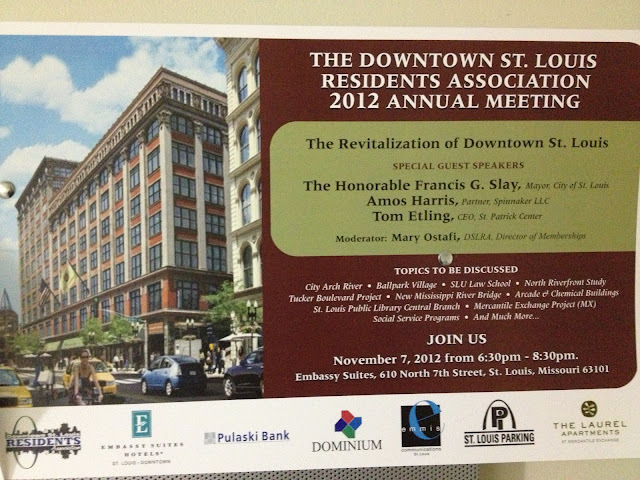 The topic, Revitalization of Downtown St Louis, is something we sort of take for granted. Its almost cliche. There have been strong, consistent forces at work for over a decade to turn around the St Louis Downtown, starting in 1999 when Clarence Harmon's administration launched DOWNTOWN NOW. With the economic and commercial real estate slow down starting to fade more into history, projects that have been in formation for years are coming out of mothballs and being reformed for today's world. Watching these Downtown St Louis Residents Association meetings go on for years, the interesting thing is that the meetings content can be useful, productive, and extremely important at all times. For whatever reason, having the Mayor as a guest seems to pull up the attendance. Two large, but less publicized topics to be addressed that I want to see is the development of the Chemical and Arcade Buildings. Interestingly, the Syndicate Trust project was a collaboration of a Minneapolis developer and St Louis based Loftworks. Steps away, we'll now have two other Minneapolis area developers investing into the St Louis area. How well these projects are handled will have a major impact on the Downtown St Louis are for decades. A good mix of vibrant street level retail and updated office or residential in these locations will serve as the anchor for the downtown economy. We should hear some information on those places Wednesday. This downtown meeting is a must. Not just to sit and listen, but to build synergy in a neighborhood where residents participate in the success of their surroundings.